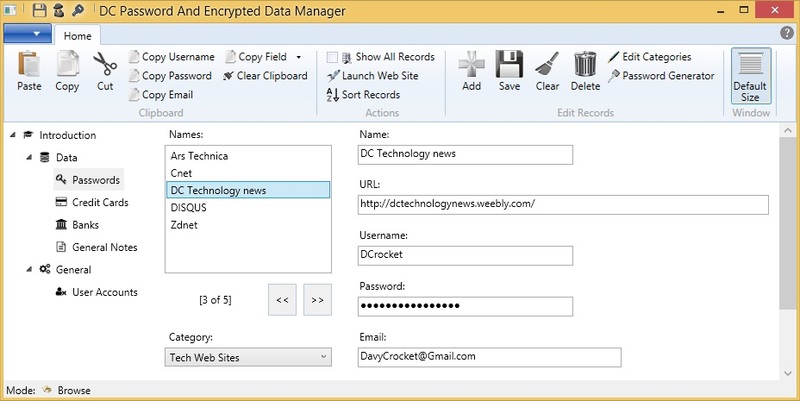 DC Password And Encrypted Data Manager - Douglas Computing, Inc.
A Windows desktop application for storing and retrieving password and other confidential data. Stores and retrieves login information for web sites, applications, etc., in an efficient and secure manner. Data stored in application is protected by 256 bit AES encryption. Works in conjunction with Dropbox, to synchronize data among copies of application. As part of data synchronization, dynamically updates data in other instances of application, when changes are made in one. Store also credit card, bank, and general notes information. Ability to assign categories to Passwords and General Notes records, for easy and flexible organization. Flexible features allow for easy backup of information. If you have Windows XP SP2 or above, click on the following, for a review of the application, and to download it from a reputable site.